1. Comfortable front pull trigger with clip for continuous use and easily operation. 2. Built in rubber hose washer provides a durable and tight seal to eliminate leakage. 3. 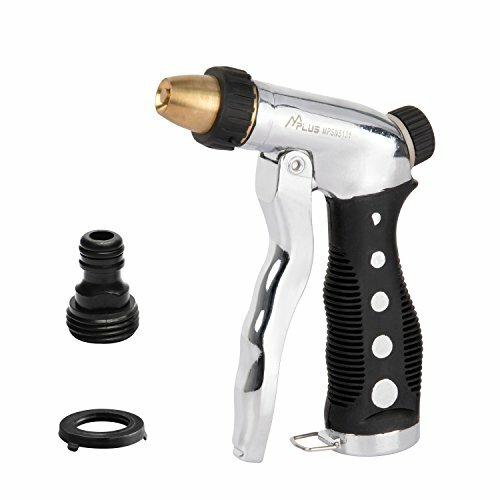 Brass nozzle provides additional durability as compared to plastic nozzles. 4. Flexible and adjustable water flow from fine mist, to moderate spray to jet stream by rotating the head. 5. Smooth adjustable water pressure control by turning the pressure control knob at the rear of nozzle. 6. Can be used for professional car/ motorcycle washing, garden/ lawn watering as well as sidewalk, balcony,corridor and carpet cleaning. 7. Quick release connector provides a quick and easy hose connection. 8. Leak-proof, rubber hose washer provides a durable and tight seal to eliminate leakage. 9. Attaches to all 5/8 inch hoses. 1 Male Quick Connector (Use optionally when there is a female quick connector attached on your hose. If no female quick connector on your hose,please unscrew the male quick connector from this nozzle and screw the nozzle directly on your hose) . 1 Rubber Hose Washer (Already installed). Warranty: 12 Months Replacement Warranty; 60 Days Money Back Guarantee. Brass head, zinc body makes it durable, corrosion resistant and maintenance free. Non-slip TPR handle provides you with a firm and comfortable grip. Adjustable and flexible watering flow and water pressure. Quick release connector provides quick and easy hose connection. Front pull trigger with clip for continuous use.